This heirloom quality two stone piece of jewelry set in 14 carat white gold measures 6mm and a jaw dropping total carat weight of 0.13. You will want to pass down this diamond cut cubic zirconia 14 carat white gold ring for generations to come. iece of jewelry set in 14 carat white gold measures 6mm and a jaw dropping total carat weight of 0.13. You will want to pass down this diamond cut cubic zirconia 14 carat white gold ring for generations to come. 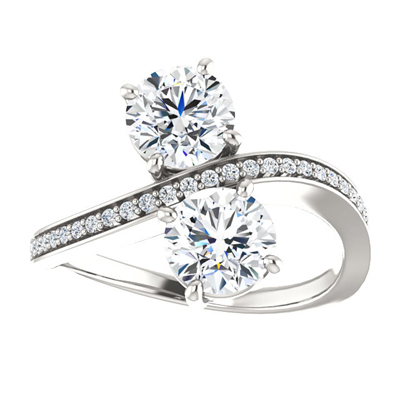 We guarantee our Two Stone CZ Ring in 14K White Gold to be high quality, authentic jewelry, as described above.